The CoffeeShop Blog: CoffeeShop Storyboard 18 Set! I wanted to post one more freebie before the holiday weekend. Today I have a new 12x12 storyboard for print or the web. This download contains two storyboards, one a simple png file with cutouts and a pretty floral pattern. The second is a fully-customizable psd file with clipping masks where you can change the background color/texture. If you are new to storyboards and need a tutorial or want to download my really helpful "Group It" action to make loading storyboards a breeze, please visit this post. 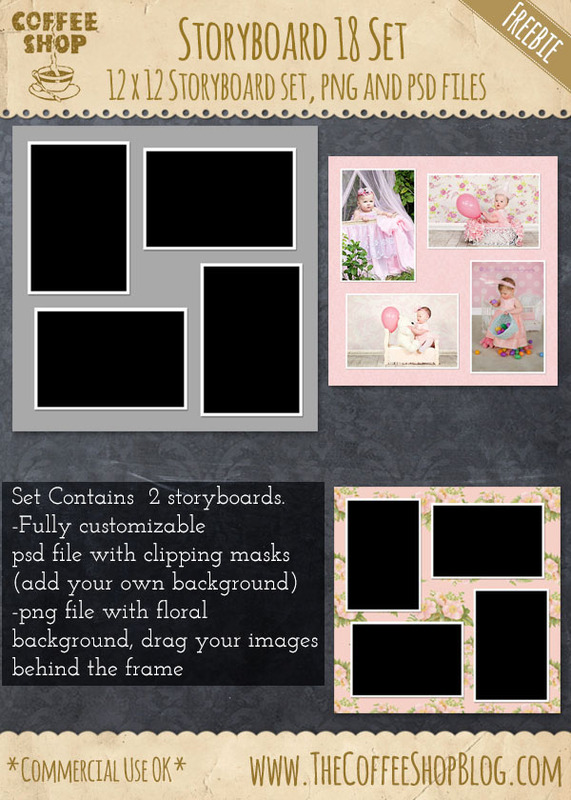 I used some beautiful baby images from Jill Wellington (Facebook, Blog) on this storyboard. Download the CoffeeShop Storyboard 18 set. You can also download it here.